Innovative Gradual Wake System Wakes You Up Gently! August 17, 2017 – BELOIT, Wis. – PlayMonster LLC‘s SleepyheadTM Animated Alarm Clocks light up mornings with gradual sounds and action of the 3-Sound Wake System! Sleepyhead Animated Alarm Clocks feature bright colors, motions, lights, sounds and music. 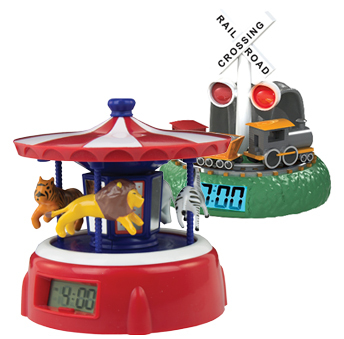 The battery-operated clocks feature an LCD clock display with an auto shut off, and are available in two fun themes: train and carousel. Dreamland CrossingTM begins the wakeup process with gentle train sounds, which leads to a resounding, “All aboard!” Finally, at the set time for the alarm, the action starts! The train moves along the circular track, and the lights of the signal flash. It’s a great way to wake up! Plus, if you want to see the train in action, press the button at any time! Carousel MedleyTM starts off in the morning with playful animal sounds, then a fun carousel medley, and finally the carousel twirls and the animals move up and down. It’s a magical way to wake up, starting the day off on a positive note! Additionally, with a press of the button, you can hear the medley and see the action anytime. Sleepyhead Animated Alarm Clocks are priced at $14.99 and make a great addition to any nightstand!